This article is part of the special IPS coverage for the 16 days of activism that start on Nov. 25, the International Day for the Elimination of Violence against Women. MONTEVIDEO, Nov 28 2017 (IPS) - Veiled and direct threats, defamation, criminalisation of activism, attacks on their private lives, destruction of property and assets needed to support their families, and even murder are some forms of gender violence that extend throughout Latin America against women defenders of rights. “They want to throw us off our land, they do not leave us alone. The helicopters fly at midnight, there are rumours that they are going to attack us,” Fanny Kaekat, an indigenous leader of the Shuar Arutam people in Ecuador, who for decades have been resisting the harassment of mining companies interested in the gold in their territories in the southeast of the country, told IPS. In 2016, the government of then President Rafael Correa (2007-2017) declared a state of emergency and the military entered to force the families out of their village. 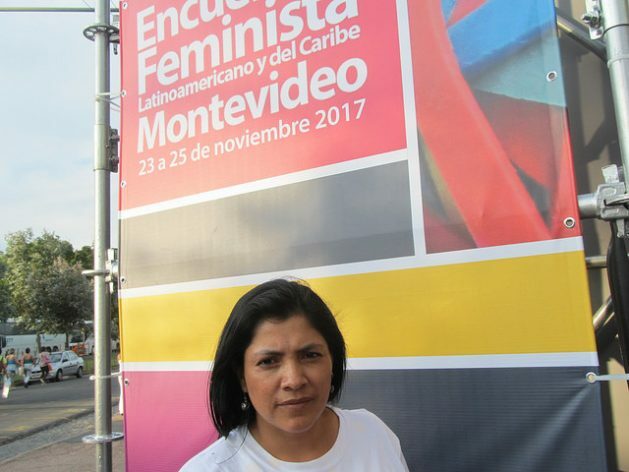 They focused their brutality on women, denounced Kaekat, at the 14th Latin American and Caribbean Feminist Conference (Eflac), held in the Uruguayan capital. “Because of our culture, we have a number of children, five or six, we cannot move easily as men, who quickly climb into the mountains. When the soldiers came, they burned our huts and kicked over ourpots with food,” Kaekat said, describing the destruction of homes and household implements necessary for sustenance. The violence against women rights activists was one of the main topics discussed at Eflac, which brought together some 2,000 feminists between Nov. 23 and 25, the International Day for the Elimination of Violence against Women, which marks the start of 16 days of activism to eradicate a problem that is growing rather than declining in the region. This is shown by the report “Commitment to Action: Public Policies to Eradicate Violence against Women in Latin America and the Caribbean”, launched on Nov. 22 by UN Women and the United Nations Development Programme (UNDP), which stresses that the region has the highest rates of gender violence not perpetrated by a partner and the second highest committed by an intimate partner. One case discussed at the Eflac was the 2016 murder of internationally renowned environmentalist Berta Cáceres, a leader of the Lenca people in Honduras and a feminist activist who was leading the defence of the right to water and the fight against the construction of a dam on the Zarca River. Although no one has been charged with planning her murder, Cáceres’ family blames Desarrollos Energéticos SA, the company in charge of construction of the dam. That year was especially cruel for those who defend their territories from the greed of companies that develop extractivist projects without respecting the right to prior and informed consultation of indigenous peoples, and without taking into account the irreparable damage to the environment and local communities. The 2016 annual report of the non-governmental organisation Global Witness points out that 60 percent of the 200 murders of human rights defenders in the world occurred in Latin America. For Denisse Chávez, from the Peruvian group Women and Climate Change, there is an escalation of violence against women in local communities, with a greater emphasis on activists, because of the role they play in strengthening community ties. “This alliance of extractivist capitalism with patriarchy targets women and seeks to control and subdue both their bodies and their territories. Those who rebel, protest and defend their rights to be free and sovereign are repressed and subject to different forms of violence,” she told IPS. Chávez recalled that the first Tribunal for Justice in Defence of the Rights of Pan-Amazonian and Andean Women, held within the VIII Pan-Amazonian Social Forum, in April in Peru’s central jungle, analysed emblematic cases from six countries, which showed that violence against women activists is due to their role in defending the territories and community life, along with specific gender biases. “It is a role that also contributes to preserving nature and the cultures and worldviews that contribute to the sustainability of life,” said the activist, whose organisation, together with other groups, is carrying out a regional campaign for the rights of women defenders during the Eflac. Nilde Sousa, of the Brazilian Women’s Articulation, denounced in the conference the plunder of territories in her country. One of the emblematic cases is that of the Belo Monte hydroelectric plant on the Xingu River, which began operating in 2016, in the Amazon state of Pará. The construction of this megaproject, she said, entailed the displacement of families, the destruction of ecosystems and an increase in violence, especially the sexual exploitation of girls and adolescents. “We have been fighting relentlessly, and we tell this encroachment by capitalism that our bodies should not be violated, our territories should not be violated, they should be respected,” Sousa declared. In spite of everything, thanks to their struggles, women activists have gained a public space, participants in Montevideo concluded. “Women rights activists challenge many traditional and cultural roles, breaking with the stereotype of women dedicated to the home, and they mobilise for a double agenda, the sovereignty of their bodies and of their territories, the freedom to decide over them. The system’s response is to discipline them,” said Chávez, alluding to the concept contributed by the Argentine feminist academic Rita Segato. 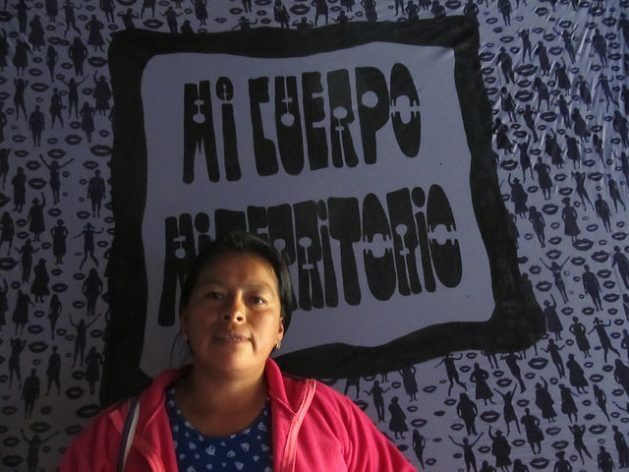 Yanet Caruajulca is one of the women who has shaken the traditional moulds and in the Andean highlands of Peru, in the region of Cajamarca, defends the right to water and demands the withdrawal of several mining companies. She heads the Regional Federation of Rondas Campesinas (literally “peasant rounds”) and has taken to the streets numerous times to protest. She is currently on trial, for vandalism charges brought in 2013. “I am summoned on Dec. 12 to hear the sentence,” she told IPS, describing the judicial proceedings as tortuous. “I had no defence counsel, the hearings are not in my district, Bambamarca, but in the capital city of Cajamarca, more than two and a half hours away by road. And I do not have the financial means for all those expenses,” she said. The wrongful use of criminal law is precisely one of the methods reported by the Inter-American Commission on Human Rights (IACHR), used to criminalise social protests and activism. According to a 2015 report by the IACHR, the effects of criminalisation include damages to mental health, disruption of family life and implications for community life. “For me it is a constant worry, I think about what will happen to my children if I am convicted, and also that if that happens, I would not be able to do anything. In addition, it would be a message to the population to not speak out, to not protest, to not claim their rights, because if they do, the same thing may happen to them,” said Carajualca. As in her case or that of Berta Cáceres and other rights defenders, the institutions are weak to protect them. The UN Special Rapporteurs on human rights and the IACHR have made successive appeals to countries in the region to comply with protecting and guaranteeing the rights of activists. There is even a UN resolution in this regard. However, the dangers persist for women activists. But, as participants in the Eflac stressed, it is by joining efforts that women will find the support and the strength to continue, under the slogan of the meeting: “diverse but not dispersed”.